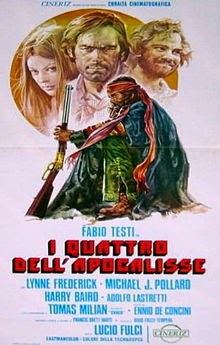 According to the bonus materials on the Blue Underground release of Lucio Fulci's Four of the Apocalypse, this was one of the last "Spaghetti Westerns" ever made. I call it a "Spaghetti Squash Western" because it pretty much looks like the thing you like, but in actuality it's more like gross, hot garbage. I have had a troubled history with famous Italian giallo director Lucio Fulci. For starters, I have hated each and every one of his films. They are tedious. They are amateurish. I guess for the time they were groundbreaking and violent, but now they come across as quaint, like the lesser works of Herschell Gordon Lewis. True, I may be biased; most of my Fulci experience has involved seeing his films during 24-hour horror movie marathons, usually in the wee, small hours of the morning—not the best time to see any movie, much less the tedious, amateurish messes that are Fulci's specialties. I was hoping his Westerns might be a different story. Oh, how wrong wrong wrong I was. Eventually Stubby and Bunny are mooooo-vin' on to a snowy city populated exclusively with rough men. The men have an unexpected reaction to Bunny's impending delivery. Soon Stubby is moooo-vin' on again—he hits the open prairie and eventually catches up with Chaco. Crude Western justice is administered. My problems with Fulci and his films are so basic as to be self-evident: in short, babies, he is not a good filmmaker. Yes, he frames some shots in an interesting manner; but no, these separate pieces never cut together into a cohesive whole. Yes, he can sometimes coax an interesting performance from an actor; but no, these performances can never save a formless, aimless, endless film. 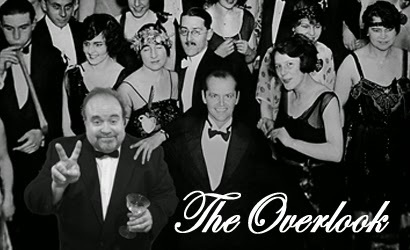 Perhaps I am missing the post-modern significance of his shoddy technique and the non-linear editing that renders even simple sequences unintelligible... but I don't think I am. Fulci's films come off as cheap looking and poorly made, like someone working too quickly on a too-small budget. The script has potential: it is based on two of Bret Harte's classic Western stories, and a better filmmaker could have done some interesting things with the characters and situations, which are typical of the genre while taking some unexpected turns. Unfortunately, Fulci has no concept of pace, or narrative, or focus. The sequence of events in the snowy town is the most interesting thing in the movie, but it is ultimately defeated by the 90 minutes of dull material that surrounds it. Like all of Fulci's horror films, the most consistent tone of Four of the Apocalypse is one of tedium. The disc case lists the running time as 104 minutes—to me it felt more like six hours. FULL DISCLOSURE: I fell asleep during Four of the Apocalypse. Twice. The first time I missed the last forty minutes. The second time I tried watching it, I fell asleep again but my wife tossed jelly beans at me until I woke up, so I only missed about a minute of the interminable "Rainy Barn" sequence. Hoping that their fortune soon will come. Through the desert, guided by the sun. Other examples of song titles from this movie: "Bunny (Let's Stay Together)," "Farewell to the Friends," "Slow Violence," "Chaco," and "Stubby, You're Down and Out." I think the titles alone will tell my readers what's on the screen when that specific song is playing. Sheesh. QUALIFIED ENDORSEMENT: Would I recommend Four of the Apocalypse to any sentient human? No. Would I recommend the Blue Underground disc release? Kinda yeah. The DVD includes one of my favorite bonus features of the year so far: an extended interview with two of the surviving cast members, Fabio Testi (still handsome) and Tomas Milian. This featurette must be seen to be believed—it comes across like an undiscovered Christopher Guest mockumentary. The two actors go on and on about working with each other (something both clearly hated, though they try to be polite in a hilariously passive-aggressive way.) They also talk about working with Fulci, who was clearly a woman-hating, actor-hating lunatic. 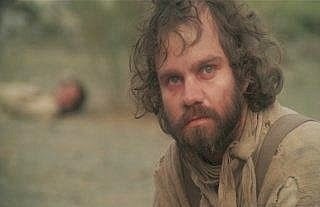 Tomas Milian, who plays Chaco, is now my favorite vain, self-obsessed, delusional actor of all time. He goes on and on about what a great performance Michael J. Pollard gives in the film—"better than me," he says—then he pauses and admits he doesn't really believe that, he was "just saying that to be nice." So, should you buy this disc, babies? Perhaps if we agree to see the featurette as the main attraction here, we can view the film itself as a mere bonus feature. After all, I think that's the way Chaco would want it. SIDE NOTE: Want to see an infinitely better Western? If you live in the Chicagoland area, our very own Patrick Bromley will be hosting the Chicago Film Critics Society classic screening of Blazing Saddles TONIGHT. It's at 7pm at the Elk Grove Cinema, and admission is only five dollars. Five dollars! Patrick will introduce the film IN PERSON and then lead a post-screening discussion. It is a cannot-miss event! I love your column and usually agree with your assessments of films but in this case you are wrong, wrong, wrong- not to recomend this to any sentient human. I consider myself sentient and I think this movie is a blast. I discovered it on the Total Film Magazine's 50 amazing films you've probably never seen which has led me to some other gems (Viy, Mr. Freedom...). I don't usually go for Mr. Fulci's work either (though I am a horror fan) but I found the western to be a great format for his amatueish trash! And yes, I agree it is trash, but like fast food, sometimes I gotta have it! And come on, Harry Baird seeing dead people?! In a western?! Also, Thomas Milian's villain?! Also those f*#king songs are unbelievable! Also Michael Pollard!! I think if you caught this one when you didn't have a case of the sleepies you may have found more to enjoy. I know I did! Yes, I may be in the minority on this one. My wife and son liked it much more than I did.